Looking for ideas on how to make money as a stay at home mom? Then you’ve probably stumbled upon a survey site at some point! It takes foreeeever to earn anything completing online surveys, right? Or worse, you keep getting thrown out because you don’t even qualify for the survey. Are all ways to make extra money online this tortuous? Finding worthwhile and real ways to make extra money online as a stay at home mom is totally possible and unlike most day jobs, making extra money on the web is something you can do at a time that suits you. So I knew affiliate marketing worked. My next step was to scale up my affiliate marketing to a full time income, so I didn’t have to get back on the office treadmill again. However, I knew this wouldn’t happen overnight, so I needed some other real online jobs suitable for stay at home moms, which could help supplement my income. In fact, it’s amazing how cash starts to add up when you juggle a few work from home side hustles, especially if you sell a few things on Amazon or Ebay and take advantage of cash back sites like Ebates. So if you’re a mom looking for ideas to make money (but want to skip the survey sites! 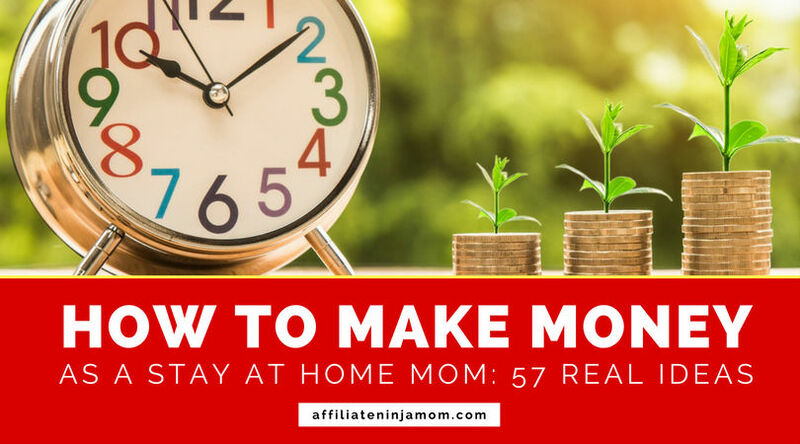 ), check out the 57 ideas for how to make money online as a stay at home mom, for lots of actionable ideas. Starting your own blog, hosting it on Bluehost and learning how to monetise it can be both fun and rewarding. In fact, it brings in a full time income for many bloggers. If others can do it, why shouldn’t you? 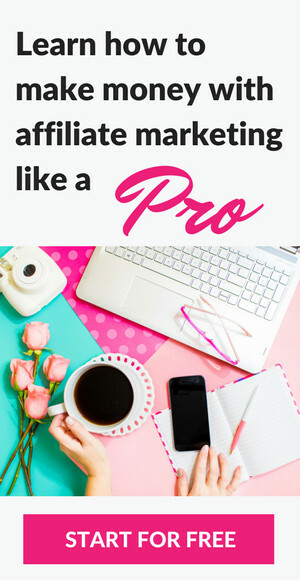 Affiliate marketing is much easier than you might think (absolutely anyone can do it!) and it can bring in real money if done right. Wealthy Affiliate show you how (step by step) and their FREE Trial offers a no risk opportunity to start your first money making affiliate site for nothing. I owe a LOT to Wealthy Affiliate and highly recommend their training and super friendly online community as an actionable way for moms to start a business online from home. Many work from home moms earn a side, or even full time, income from sourcing products and selling them on the ‘Fulfillment by Amazon‘ program. The Selling Family show you exactly how it’s done. Starting your own online store is much easier than you might think. Steve, at My Wife Quit Her Job, made over $100k in 12 months and offers a free 6 day mini course that can get you started. Do you have a skill you could teach others? From sewing to guitar playing or photography skills, many everyday moms are creating and selling their own courses on sites such as Udemy and Teachable. On Fiverr, freelancers sell their skills for $5 (known as a ‘gig’) in areas ranging from graphics and copywriting to design and social media skills. If you have a legitimate service to sell, you can do the same. Whilst $5 may not sound like a lot, if you can find a gig that’s popular and doesn’t take you long to do, the money can start to mount up. This article in Forbes shows how 3 people have made a lucrative FT job from Fiverr and this article shows you an actual step by step example of how to make real money selling Fiverr ‘gigs’. Are you a mom who can spin words like a pro? Then freelance writing could be for you. 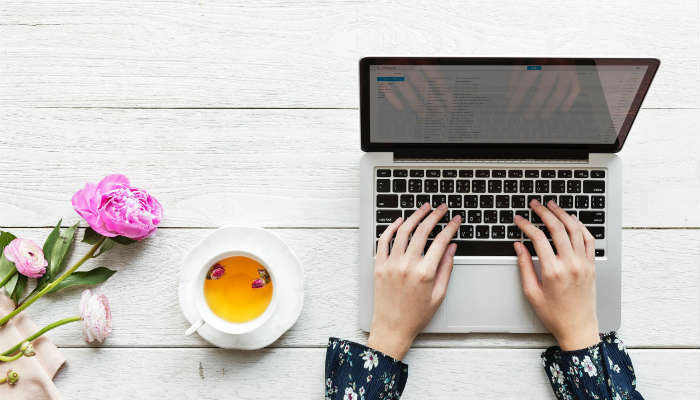 A site like Content Mart will connect quality copywriters with relevant clients, whilst Freelancer can be a good choice for those just starting out. Making a Living Writing is also a good resource. Fancy writing your own ebook? Kindles and ebooks have blown the publishing world wide open. Literally anyone can write, publish and sell their own ebook and Amy Lynn Andrews shows you how. According to Cisco, it’s expected 80% of web traffic will come from video by 2020. So now is the time to get on the video bandwagon ladies. create a video review with easy to use video creation software such as Content Samurai (it’s a paid service but you get a FREE 7 day trial, which is ample time to create a couple of videos if you don’t want to sign up to the full service). Ever wanted to design and sell your own product? Well, with Teespring you can. You create the design, gather an audience and Teespring handles all the fiddley bits like production and shipping. Transcription is another popular way to make money online as a stay at home mom. And with speechpad you get to choose when and how often you want to work doing paid transcription jobs. You can apply here. Sign up to the Zazzle Associate Program and get paid for promoting and sharing other people’s customised gifts and creative products. Are you a qualified teacher or can you teach a second language? Then being an online tutor could work for you at wyzant.com (US) or mytutor.co.uk (UK). Upwork is a another good way to kickstart your freelance career, selling skills you already have. There are loads of freelance job categories to choose from – from translation and admin support to sales, writing and design. You can earn money really fast with matched betting. Profit Accumulator (UK only) show you how, plus offer a FREE Trial where you can earn around £45. I regularly earned from £300 to £600 a month with matched betting. Some people earn £2k a month. Oh and LOADS of UK stay at home mums do it! Want to get paid around $10 (£8) for a website review? You can with User Testing. It’s easy to join and they pay up regularly via Paypal. There are loads of companies online who will buy your old cell phone or even your used iPod or Mac. Try www.gazelle.com in the US or www.mobilecashmate.co.uk and www.mazumamobile.com in the UK. Alternatively, many phone networks will buy your old mobile too. Selling your used clothes on Ebay is a great way to free up closet space and make money at the same time. Most of us moms have some clothes knocking around we no longer wear and branded jeans and well presented bundles of baby or kids clothes tend to sell well. Or you could try selling your maternity wear. Got some preloved furniture items knocking around or a working fridge freezer sitting idle in the garage? Craigslist or Gumtree are a great way to shift bulky items for some quick bucks. If you have more time, selling via Amazon (or to a local second hand store) is likely to earn you a bit more. I know, who an earth would want to part with their Lego, right? But just in case, you can sell it on www.bricklink.com. Got a huge pile of old college text books lying around? www.bookscouter.com will help you sell them for the most money by comparing offers from over 35 book buyback vendors. 25 – Sell your breast milk! For Moms in the UK, try Only The Breast. You can also donate your surplus breast milk for free to the NHS Milk Bank. Ok, so not all of us have an old Louis Vuitton bag knocking around! But if you’re a bit of a label lover and have some items you no longer wear, why not sell them on poshmark.com? The Penny Hoarder have some tips to get you started. Do you snap a lot of photos on your phone? Try selling your best ones on foap! Crunchy Betty makes her own organic natural care products and was pushing over 30,000 sales on Etsy last time I looked. So if you have a hobby, such as sewing or photography, where you’re able to create items of a saleable quality, try selling them for a profit on Etsy. Loads of moms are doing it. Got a decent SLR camera and a good eye? If you can take a professional looking photo of hi-res quality, you can submit your shots to stock photos sites and they’ll pay you a commission every time one gets downloaded. I once found an original Tomb Raider figure hiding in the cupboard that was selling for quite a bit on Ebay. People will pay a lot of money for original movie posters, rare vinyl and out of production TV and movie merchandise. So dig around for any old stuff lying around, which may be sellable to a collector on Ebay (just don’t sell Dad’s original Star Wars figures without asking first;)). Don’t throw away your used ink cartridges! You could get some cash for them. In the UK try Ink2cash or in the US, check out this guide from Penny Hoarder. Reward sites take time to earn much of value, but if you spend a lot of time online, you can earn credit for completing simple online tasks or offers. Everything adds up over time and Swagbacks in particular can be a good way to earn Amazon vouchers for birthdays or Christmas. If you spend time online searching for coupons, you can share them on Coupon Chief and get paid 2% of the sales from any of the coupons you share. It might not make you rich, if you have the coupons anyway, it doesn’t take long to join up and start sharing. You can really save on your grocery shopping with Ibotta and moms love it as a way to earn a bit of extra cash. A free mobile coupon and cash back shopping app, simply sign up and earn cash back on certain products by performing tasks, purchasing the product, then providing photo proof of purchase. ‘Comping’ or entering lots of competitions in the hope of winning cash and other prizes of value, is a full time job for some people. Money Making Expert offer 42 Comping Tips here. It’s aimed at the UK, but the ideas and tips can be applied globally. Entering ‘#competition’ into Twitter can also be a quick way to source online competitions. Tip: To avoid lots of junk email into your main email account, it’s advisable to set up a dedicated free email account for competition entries. The domain name Hotels.com was sold for a staggering $11 million in 2001. It’s unlikely you’ll replicate that!, but you could try searching Namecheap for domain names with commercial potential. These tips from GoDaddy on buying and selling domain names for a profit should help. sedo.com is a popular auction site for selling on domain names. Warning: Avoid buying domain names of well known brands, companies or people with the sole intention of making a profit – this is cybersquatting and can be illegal. You’ll need certified qualifications to do this, but Just Answer (UK site here) estimates that answering 5 hours of legal questions, a week, could earn you up to $532 via their site. 5 hours of home improvement expertise could bag you up to $193. 39 – Make money with the ‘Disney Vault’! They’re clever chaps over at Disney and only release each Disney film for a limited time, after which it goes back into the ‘Disney vault’ for a few years. If you buy up Blu-Ray and Special Edition versions when they become available, you can often sell them for a lot more, on Amazon or Ebay, once they go back into the vault. Got a free parking space in your garage or driveway? Many people hire theirs out via a site such as Park Whiz (US), Just Park (UK) or Your Parking Space (UK). OK, so you won’t technically be making the money ‘online’, but if you have spare time on your hands, you can certainly hire out your babysitting services on a site such as www.findababysitter.com (UK) or www.urbansitter.com (US). Are you a mom with a strong social media following? If so, Izea is a popular way to get sponsored share opportunities. In a nutshell, this means you can apply to share something about a brand on social media and if you get accepted, you’ll get paid for it. Izea also connects bloggers with brands, so if you have a blog and want to get paid for promoting a brand you admire, Izea could make some money for you. Amazon Turk offers micro jobs (HITS) such a data entry, or audio transcription, for which they’ll pay you a fee. Fees paid are often pretty low – however, you can choose your own hours, pick the jobs you want, plus work your way up to higher paying jobs once you’ve successfully completed a number of HITS. Here’s a review from someone who made decent money from Mechanical Turk with the right approach. Are you good at spotting trends? People will pay top dollar for the latest ‘must have’ items and it’s not that hard to spot something that’s becoming popular and cash in on it. Products from the Disney catalogue work well here – one stay at home mom bought up loads of Frozen dresses and sold them for a huge mark up on eBay! Google Trends can be a good source for what’s trending. When I looked, Donald Trump was in the Top 20 search trends and when I popped onto eBay, I discovered Donald Trump face masks are pretty big sellers right now! If you have a spare room or apartment and don’t mind washing some extra bed linen now and again, Airbnb is a popular way to make some extra money as a stay at home mom. Seriously! For a bit of extra cash, bung all your empty cardboard ‘loo’ rolls in a box and shift them on eBay for a quick profit. Prices vary, but you can get around $5 or £5 for 40+ empty tubes. Schools or parents will buy them for arts and crafts, especially at times like Easter and Christmas. At freepostcodelottery.com they give away £750+ per day FOR FREE. Simply enter your UK postcode and an email address and if you postcode comes up, you’re a winner. I’d suggest you don’t use your main email address if you try this (set up a new free Gmail or Hotmail one), as I suspect you may get marketing emails from their advertisers. Download the Street Spotr app on your Smart Phone and perform simple challenges, such as taking a photo of a supermarket or price list, and get paid for it. You won’t make a fortune, but once you get going with a few challenges, the cash can start to add up. Investing in the stock market is now something anyone can do with the help of online market trading platforms. eToro is one of the most popular and it’s a way to extra make money as a stay at home mom if you like figures. Disclaimer: Investing in the stock market can be volatile & it’s possible to lose money, as well as make it. Please ensure investing or trading in the stock market is suitable for you & you understand the risks involved. Using a bugeting app can be a great way to keep track of your money. Most people live paycheck to paycheck, but using a budgeting app can help you stay on budget as a stay at home mom, avoid bank charges and save money by building up a reserve fund. Competition among banks, for your custom, is high and many offer a generous incentive to switch your account to them. Try The Penny Hoarder for some US bank promotions or head over to The Telegraph for some UK bank incentives. Stash is a great way to start investing with just $5. You’ll need to invest more over time to make worthwhile returns, but the Stash app makes investing super simple for beginners, plus you get to choose investments based on your interests. Depending on the rarity, if you find one of CoolSerialNumbers.com’s most-wanted serial numbers on a dollar bill, it could be worth a lot of money. Similarly, find a water mark of Jane Austen on a UK plastic £5 note and you could be ‘quids’ in. Stoozing is all about making money from 0% interest periods on credit card loans. It works by using the credit to invest in a high interest savings account. Then, when the 0% interest period expires, you use the money in the savings account to pay off the loan, then keep any profits from interest accrued. uSwitch offer a useful guide. Disclaimer: Stoozing requires discipline. Only attempt it if you are good with money and understand the concepts, as well as the risks. Sometimes, you don’t even need to switch accounts to earn a reward from a bank. 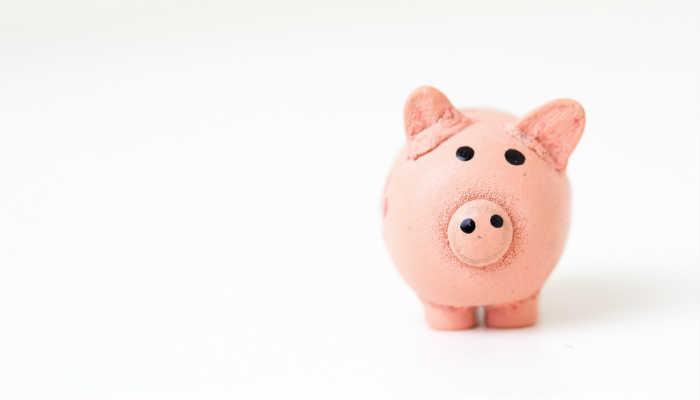 Simply opening a new account and fulfilling a few criteria, such as depositing a certain amount within a given period, is often enough to bag yourself some cash. Google a search phrase like ‘banks offering incentives to open an account’ and you should get lots of options. Are you a student who worked over the summer or a new stay at home mom who perhaps overpaid on tax during maternity leave? If so, you may have overpaid your tax. In the UK you can use this calculator to check how much tax you’ve paid and whether you may be due a refund. According to Money Making Expert up to ‘£15 billion of unclaimed financial assets in the UK lie in old bank accounts, pensions, life assurance and investments’. If you think you may be sitting on some lost assets, this guide should help. So there you have it. 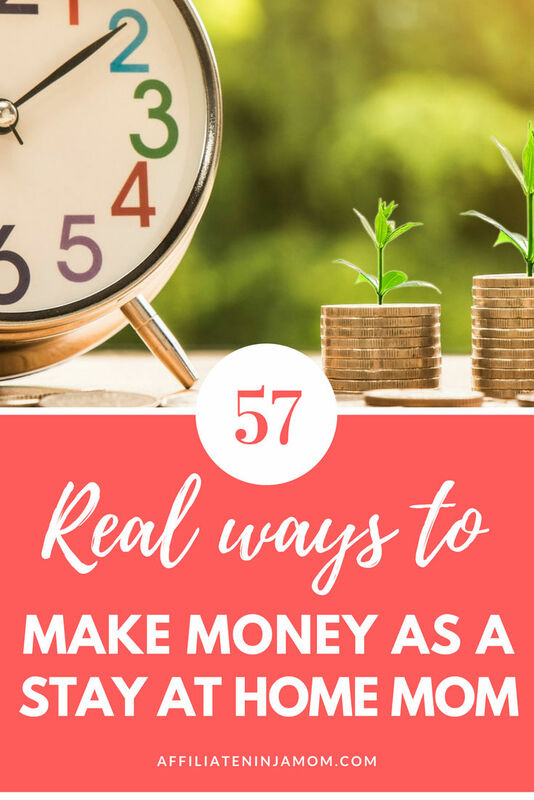 57 ideas for how to make money online as a stay at home mom. Now it’s your turn, to go forth and start earning! Have you tried any of these ways of making money from home? Do you have any other good tips for how to make money as a stay at home mom? Previous Post: « 15 Feminine Free Stock Photo Sites: Your Guide To Girl Boss Images! Wow this is gold for stay at home moms! Really detailed. The more I kept reading the more excited I got. Great Job! How many of these did you try? I know I have to try some of them. As long as we have the time, conquering the world should be an easy task for any mom. Thanks! Thanks Jackie! Really pleased you found it useful. I’ve done quite a few actually. Blogging, Wealthy Affiliate (which taught me affiliate marketing), selling stuff on Amazon, Profit Accumulator, User Testing…it all adds up. Hello Sarah, I am Ruth I love how you detailed all these online jobs. I will be getting married soon and I would like to stay at home. My problem is that I don’t know too much about computer and I would really love to learn many things from you. I live in UAE, Abu Dhabi to be presise and I will really want to start with that of toilet roll paper but I don’t know how to go about it. Hello Ruth, it’s a UK article, but there is a guide to selling toilet roll tubes on Ebay here. Or if you do a search for ‘how to sell toilet roll tubes on Ebay’ you should find some helpful articles on the web. I know you say you’re not that familiar with computers, but you could try Wealthy Affiliate – they teach beginners step by step how to build a website and make money via affiliate marketing. It’s perfect for people not that comfortable with computers. Just an idea. It’s where I started and I really rate them. If you need any more help you can email me at hello@affiliateninjamom.com.